In this article we show you how to setup a paycheck calculator so your employees can run “what-if” scenarios. The employee needs to have access to Microsoft Dynamics GP as a limited user. 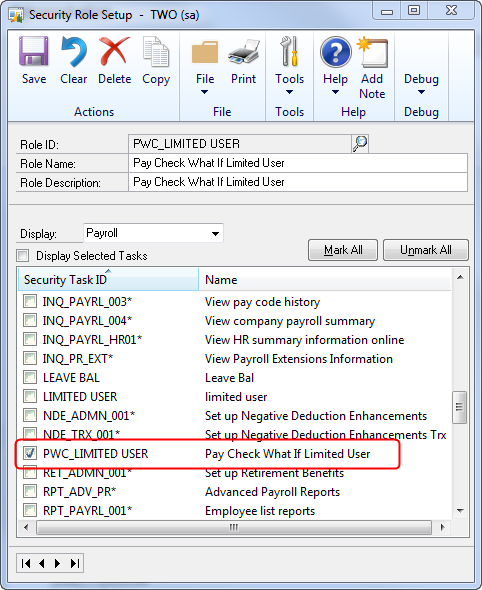 Assigning the limited user type allows this user to view Employee Self-Service information for the Employee ID linked to the GP user ID. To create the User ID open the User Setup window and assign the User Type Limited. Next, we need to link an Employee ID to the new User ID created in the previous step. From the Employee Additional Information Maintenance window, you can map the GP User ID to a specific Employee within Microsoft Dynamics GP for each Dynamics GP company that the employee accesses. This will allow the limited GP user to login and open the Pay Check What If Calculator window and run What if Calculations for only their Employee ID. Next, we can setup the GP user to have access to the Pay Check What if Calculator window. Open the Security Task Setup window then select a current Task ID assigned to this user or create a new task. We will create a new Task ID of “PWC_LIMITED USER”. Select Paycheck What If Calculator as the Product, Windows as the Type and 3rd Party as the Series. 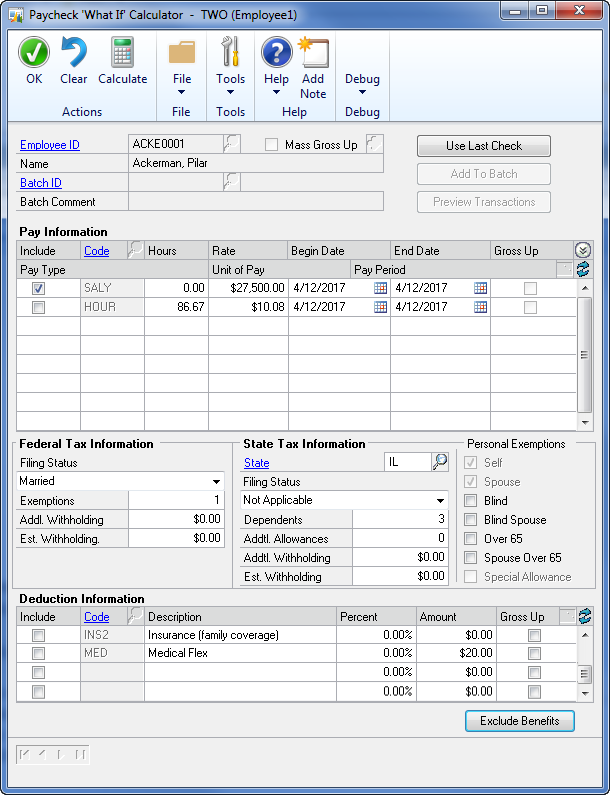 In the Access List, check the option for Paycheck “What If” Calculator. After we have created the Task ID then we can assign it to a Security Role. Open the Security Role Setup window then either select a current Role ID assigned to this user or create a new one. 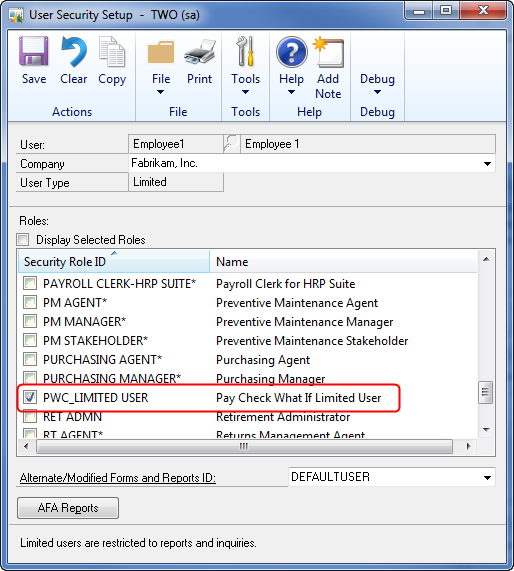 We will create a new Role ID of “PWC_LIMITED USER” then select the Security Task ID we setup in the previous step. Next, we can open the User Security Setup window and assign the Role ID to the user. If you used an existing Role ID already assigned to this user you can skip this step. If you setup a new Role ID then select the Security Role ID from the previous step. 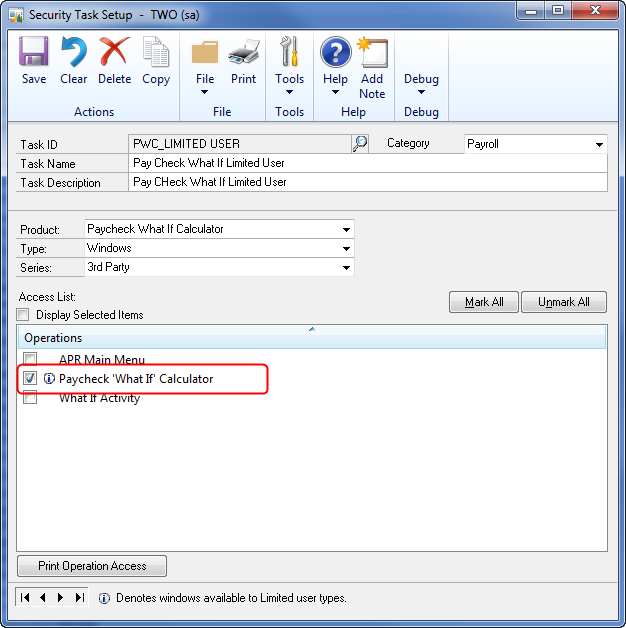 Now that all the security has been setup, when the Employee logs in to Microsoft Dynamics GP they will be able to see the Pay Check What If Calculator window and run a calculation for their Employee ID. Since the User ID is a limited user, the system will only display the Employee ID connected to the GP user. In our example, we linked the GP User to ACKE0001 thus; we can see ACKE0001’s information.